BPA Free Paper Rolls only use "Grade A Paper" to make our 76x70mm 3 Ply (White / Yellow / Pink) printer rolls. By using only Grade-A Dust Free Paper Rolls you will protect the print heads on your printer from damage. Replacing print heads on your dot matrix printer can be nearly as expensive as buying a new machine. Cheaper Till Rolls will leave dust to clog up your printer and damage your print heads. In these cases cheaper is not always better, the only answer is - High Quality, Low Cost "Grade A" Dust Free Paper Rolls from BPA Free Paper Rolls. If you are not sure which 3 Ply Till Rolls you need Check out our Quick Find feature above. Or , Ireland Ph: +353 (0)1 4433964 - UK Local Ph: +44 (0)20 8144 4475 and we will be more than happy to help you find what you require. 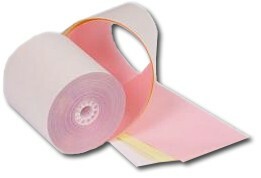 List of reciept printers & Kitchen printers 76x70mm 3 Ply Paper Rolls will fit.